Now you can get on top of your daily to-do list with a planner of your very own. And the best part is you will have fun doing it. Too busy to think? Always late? Feeling overwhelmed by your schedule? Sounds like you could do with some structure. A daily planner can help you get productive, keep track of special dates and make sure you keep appointments. The best part is Canva make it easy to design your own daily planner using an intuitive drag and drop approach, without any fancy design software in sight. In fact, when you are done your work might just be confused with a professional designer’s. We promise not to tell. 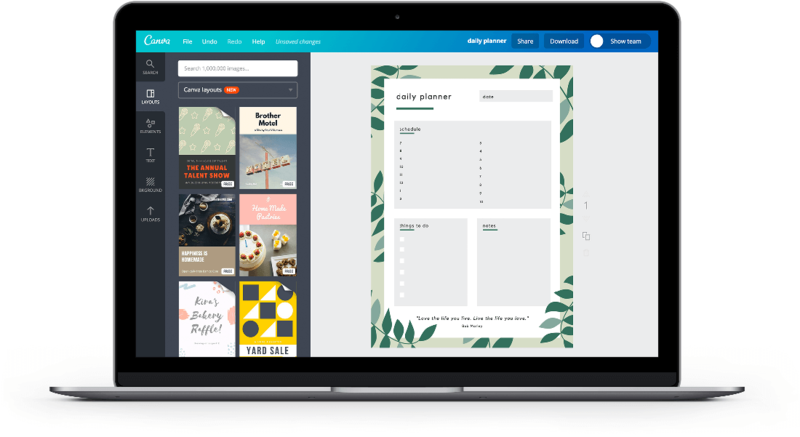 Create a new Canva account to get started with your own Daily Planner design. If you’re the type who needs a little help in getting your day started or you just love to collect beautiful quotes, why not add one to your planner and set the theme for your day? Use Canva’s text tools to create some beautiful typography for your favorite quotes. Or, try browsing Canva’s amazing media library, home to over a million high-quality stock images, illustrations and icons. There are plenty of free ones in the library and premium ones never go beyond $1 for each one time use. Once something has caught your eye, just drag and drop it into your workspace and tweak as much or as little as you like. Activities and plans can crop up anytime. So if you need to move things around or change up a few dates, you can always access your Canva design anytime, anywhere. All your designs are stored on cloud, so once you’ve registered, you only need to log back in using any computer or laptop. You can even access Canva on the go using your iPhone, iPad or Android devices. You tend to remember some things better if you write them down, so make sure you print your daily planner. Simply hit the “Download” button, save your design as a high-res PNG file or a print-ready PDF and voila, you are good to go! You should now be a more organized, productive, and infinitely happier human being. Congratulations!